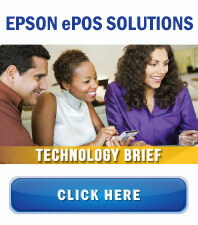 Epson TM-Intelligent Solutions. Mobile. Smart. Connected. The TM-Intelligent family represents a new class of smart Point of Service (POS) solutions that provide the application power and configuration flexibility that retailers and service providers are looking for today. 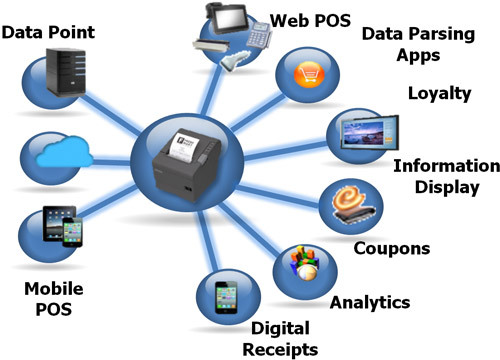 Our TM-Intelligent solutions combine Epson’s industry-leading POS printers with built-in intelligence to deliver everything from cloud services, flexible web-based printing, open platform mobility and peripheral connectivity to latest PC POS systems and more – all in one small footprint. 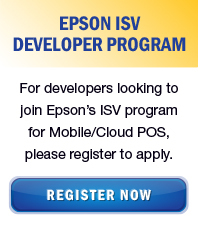 Read about Epson’s ePOS Print Technology that drives the TM-Intelligent i series and DT series products. Epson’s TM-Intelligent i-Series is designed to support mobile POS, web-printing from any mobile device, cloud services, information display applications and kitchen display systems (KDS). Epson’s TM-Intelligent DT-Series is designed to support everything from flexible, mobile POS configurations with web-based printing, cloud services, information displays, peripheral connectivity, Web-POS and portable POS systems to complete PC-POS replacement systems.